The thundering of hooves, the flaring of nostrils and the flying manes of hundreds of horses and ponies provide an exhilarating vision of freedom and joy for animals and humans alike during the annual public run celebrating the end of the winter season. In central Germany it has become a tradition for crowds to gather on this special day, to watch the running of the horses. What started as a celebration by the animals themselves, the release of the horses has now become spectacular entertainment for the public, who gather in their thousands for the event. This delightful video shows how the horse breeders at the Meura stud farm in the rural region of Thuringia state drive their herd of hundreds of over-wintered animals out to graze for their first day on their summer pasture. Then hundreds more hurtle down the lane, all shapes, and sizes, all colors and patterns but all with a single purpose. Watching the video, you can almost feel their hot breath on you as, racing headlong to their goal, they pant and snort through their exertion. The last thing you see is the dear little donkey bringing up the rear, galloping for all he is worth to join his bigger pals on the open pasture. He is joined by two fat, little ponies, still fluffy with their winter coats not yet fully shed. This video is a rare sight that you should not miss! That was AMAZING! 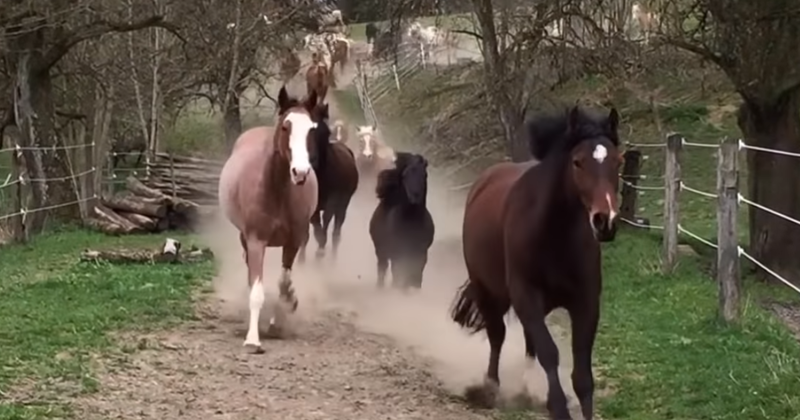 If you liked this video, share it with your friends because it isn’t every day you get to see a herd of horses hurtling towards you. WOW!